Four U.S. Senators questioned the U.S. Army Corps of Engineer officials about Missouri River flood protection priorities during a field hearing in Glenwood on Wednesday. Iowa Republican Senator Joni Ernst hosted the Senate Environment and Public Works (EPW) Committee field hearing in the wake of widespread flooding throughout southwest Iowa. The hearing focused on the Corps' management of the Missouri River basin flooding. Major General Scott Spellmon (left) responds to a question during a field hearing in Glenwood on Wednesday. The flood waters have caused an estimated $1.6 billion in damages in Iowa and another $1.5 billion in other Midwestern states. Corps officials contend that little could have been done to avert the flash flooding that toppled and breached the levee systems. Major General Scott Spellmon, the Deputy Commanding General for Civil and Emergency Operations, told the senators and about 250 attendees at the hearing that the Corps' primary focus in times of flooding is public safety. "The number one priority of the Corps in all of our operations and all our projects remains life and public safety," he said. "The damage to the levees in the region is extensive. Many levees across the entire region from Council Bluffs to Kansas City overtopped during this flood." At least 32 levee systems were completely underwater during the floods and as of Wednesday morning they counted 114 breaches in those levees, Maj. Gen. Spellmon said. Army Corps officials are working to close the breaches and regain flood protection for cities and farms in the Missouri River basin. One of the more substantial breaches is in a levee that protected the city of Hamburg, he said The breach will require nearly one million cubic yards of material to complete the initial emergency closure. "This is equivalent to approximately 100,000 dump truck loads of material," Maj. Gen. Spellmon said. He told the senators that flood events were widespread across the country during the winter and spring months of 2019. "At one point over 300 river gauges indicated a flood stage at various locations across the United States," he said. "This year’s flood season has been challenging." John Remus, chief of the Missouri River Basin Water Management Division of the U.S. Army Corps of Engineers (Civil Works), Northwestern Division, said considerations for endangered species along the Missouri River "did not influence our reservoir operation during this time" but the senators and witnesses at the hearing questioned that statement. Leo Ettleman, an Iowa Soybean Association member from Sidney, gave comments and answered questions during the field hearing. "For years I have worked with my downstream Missouri River colleagues to make flood control the number one priority of the Corps in its management of the river," Iowa Republican Charles Grassley said during his opening statement. "Protection of life and personal property should take precedence over recreation and experiments that may or may not help endangered species and the other six functions identified in the Master Manual." Grassley reminded those in attendance that last year a federal claims judge ruled in a mass action lawsuit of 372 plaintiffs from Iowa, Nebraska, Missouri, and Kansas that the Corps’ changes to the river “had the effect of raising the Missouri River surface elevations in periods of high flows.” The court found that since 2007, the flooding has been among the worst in the history of the river and that the Corps’ changes in the management of the river caused or contributed to the flooding. "It seems to me that misguided decisions and misplaced priorities have eclipsed common sense," Grassley said. "A little more Midwestern common sense might have protected local communities, millions of bushels of grain, and tens of thousands of acres of farmland." Leo Ettleman, an Iowa Soybean Association member from Sidney, gave comments and answered questions during the field hearing. A levee breach near Percival last month flooded Ettleman's fields and damaged grain stored in bins. Flood damage to his family farm in 2011 led him to work with others in the area to organize the group Responsible River Management. The group has tried to forge working relationships with the U.S. Army Corps of Engineers, U.S. Fish and Wildlife Service and numerous other stakeholders. They have also worked with the Missouri River Recovery Implementation Committee. Ettleman contends the 2004 change in river management protocol has led to an increased frequency and severity of flooding in the Missouri River basin. "The committee should view the 2019 flooding and all flooding since 2004 as being continuous flooding caused by the Corps’ implementation of the MRRP," Ettleman said. The MRRP, according to Ettleman, changed the management of the reservoir system, especially the volume and timing of the release, and the volume in the channel due to control structures. Furthermore, he said the Corps’ management reconnected the river to the flood plain resulting in flooding that he believes would not have occurred otherwise. ISA Director of Policy Development Michael Dolch commended Grassley and Ernst for shedding light on the devastation and recovery effort along the Missouri River. According to Dolch, the ISA opposes policy in the Master Water Control Manual that would cause seasonal flooding or restrict barge traffic on the Missouri River. Congress failed to pass a disaster relief package to provide funding for citizens impacted by flooding last week prior to a two-week break. Ernst said that assistance is at least another week away but she is optimistic that Congress will pass the funding. "We have an immediate need for people to receive disaster assistance," Ernst said. "Because of the low property values in the Midwest, we are often the last ones to receive funding from the federal government. Hopefully, we can get a movement of enough senators that we can take this [information] back and make changes." New York Democratic Senator Kirsten Gillibrand said all Americans deserve assistance when faced with disasters like this. "It is Congress’ job to pay for flood damage here and I fully support doing that," Gillibrand said during the field hearing. "I’m going to fight to make sure that you get every dollar you need here in Iowa just as I would fight to make sure every American citizen, whether they live in my state of New York, or Puerto Rico or anywhere in the Midwest, get the disaster funding they need." Kansas Republican Senator Jerry Moran said he hopes his colleagues in the Senate approve an emergency supplemental funding bill with money directed to fixing the levees impacted in the Missouri River basin. "People have built their lives around that flood protection. The value of their land is determined by that flood protection and if they don't repair the levees then these landowners no longer have a livelihood along the Missouri River," Moran said. As federal and state agriculture officials toured flood damage from the Missouri River, it became evident that recovery can’t start until flood waters recede. Nearly two weeks after a dangerous mix of heavy rain, melting snow and frozen ground caused levees to topple and cities and farms to flood, the area continues to see large volumes of water push into the Missouri River basin. Federal officials toured Hamburg and other communities in Fremont County Thursday to survey damage from Missouri River flood waters. Jorgensen and other Fremont County farmers welcomed U.S. Department of Agriculture Under Secretary Bill Northey, Iowa Secretary of Agriculture Mike Naig and other officials to Hamburg on Thursday to tour damage caused by the Missouri River flooding. "One of the challenges is that right now we see water," Northey said while looking at a flooded area of Hamburg while heavy rain fell. "You don’t know how much of a mess is underneath all of that water. Once that water recedes, there will be an awful lot of expense before they can get back to farming." The Missouri River flooding was triggered by a combination of a "bomb cyclone" storm that impacted the Midwest the week of March 11, a rapid melting snowpack and already saturated ground. Now two weeks later, record amounts of water continue to flow into the area through levee breaches caused by flash flooding. Mike Stenzel shared his story with government officials and news reporters yesterday. A third-generation farmer, Stenzel farms 2,500 acres of land along the Missouri River with his son Michael along with another 1,200 acres east of Hamburg. USDA Under Secretary Bill Northey about damage his farm sustained from Missouri River flooding. The Stenzels are among 31 growers in Fremont County with grain in storage, over 390,000 bushels of soybeans along with 1.25 million bushels of corn have been potentially destroyed, with total crop losses estimated at $7.3 million. That number could increase as flood waters retreat. Mike Stenzel said they have some flood insurance but doesn't believe his grain will be covered. Jorgenson is worried about damage to the 750 acres of land he farms in the Missouri River valley but considers himself fortunate compared to others. When the water recedes, he expects to deal with large amounts of debris, sand and deep ruts caused by erosion. He was able to move grain from storage bins before floodwaters inundated his fields. Northey told the farmers that he would take two messages back to his boss, U.S. Agriculture Secretary Sonny Perdue. First, farmers will need help to recover, and, second, changes are needed in how the Missouri River is managed to prevent future flooding. "Each of these (floods) take a big bite out of their economics in a time that is pretty tough," he said. "You hurt for them. You have folks that have been here for generations." President Donald Trump granted Gov. Kim Reynolds’ request for a Presidential Major Disaster Declaration on March 23. The declaration makes assistance available to homeowners, renters, businesses, public entities, and select nonprofit organizations in 56 counties that have been severely impacted by recent flooding along the Missouri River and other parts of the state. The declaration by the President makes available the Federal Emergency Management Agency's (FEMA) Individual Assistance Program for five counties, which provides aid to eligible homeowners, renters, and businesses. Residents in Fremont, Harrison, Mills, Monona, and Woodbury counties are eligible to apply for this program, regardless of income. Individuals and business owners who sustained losses in the designated area can begin applying for assistance by registering online at www.DisasterAssistance.gov or by calling 1-800-621- 3362 or 1-800-462-7585 TTY. The toll-free telephone numbers will operate from 7 a.m. to 10 p.m. (local time), seven days a week, until further notice. The Iowa Department of Agriculture and Land Stewardship urges farmers to work with their insurance providers and take inventory of any damage. The department’s website, iowaagriculture.gov/news/resources-flooding, provides a list of resources for those impacted. "We recognize that we’ve got a long road ahead of us," Naig said. "The Iowa Department of Agriculture and Land Stewardship will continue working closely with the governor’s office, other state agencies, the USDA, and our state’s elected officials to coordinate relief efforts. In the meantime, we know that Iowans will do what we do best — band together to help our neighbors in need." Soybean farmers in western Iowa are picking up the pieces after flash floods and rapid snow melt caused ample losses in grain storage and equipment. The rolling hills of Bryan Reed’s farm near Albia provided a serene backdrop as cows and calves basked in the spring sun on Friday. Reed navigated his utility vehicle through the pastures checking the health of calves that were born just days earlier. With the sun shining you could see a spring in Reed’s step as he finished his daily chores. That hasn’t been the case for the majority of his calving season though. A pasture next to Reed's farm is speckled with cattle during calving season. The calendar says spring but Mother Nature refuses to close the door on winter. Snow, ice and rain have made this calving season especially tricky. Reed says that every calving season is different. 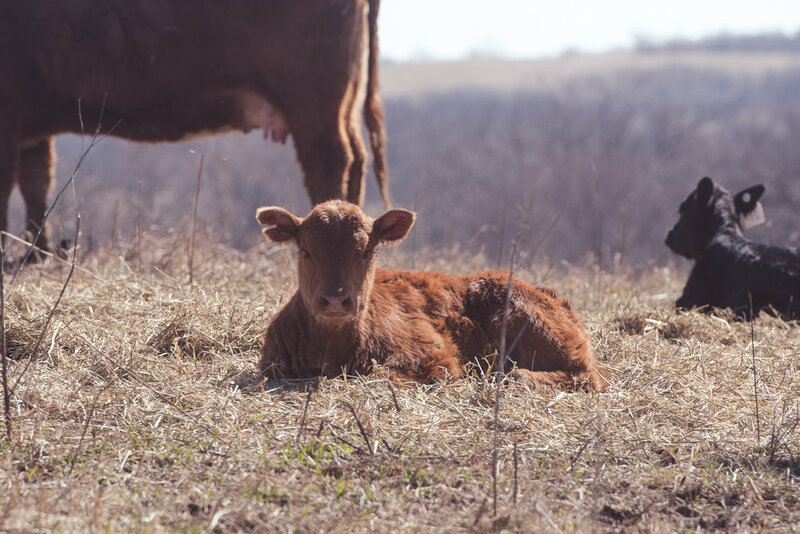 Calving season starts in mid-February at Reed's farm and goes through late May. It isn't a surprise that winter is a difficult time to care for livestock, but some winters are more comfortable than others. "It happens regardless of the weather. It's going to be going on 24/7 whether the weather is cooperating or not. Whether you are sick or not," Reed said. Reed recalled several years ago when a fight with the flu came during a rush of calves. "My wife drove me to the emergency room because I got run down," he said. "They gave me IV fluids and I was back home working with the heifers later that night. You have one chance to keep that calf alive and that is my paycheck for the year." 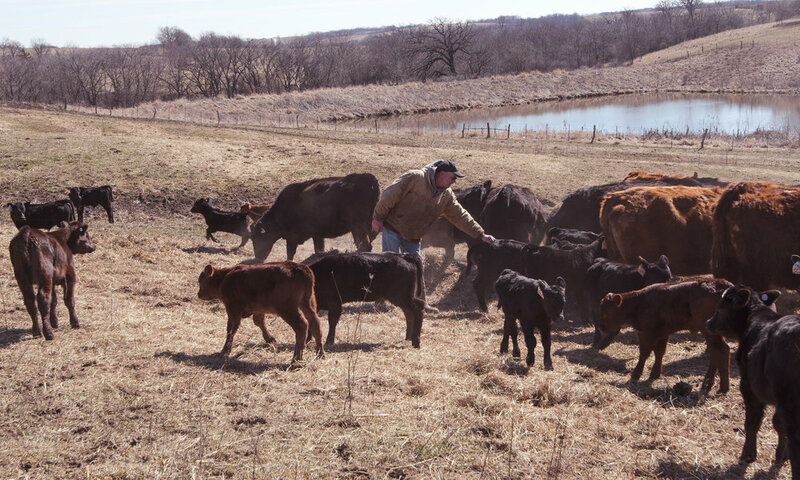 During a typical spring calving season, Reed expects about 240 calves and another 60 during the fall. But over the years he has discovered that there is nothing ordinary about calving season. "Everyday is different and has different issues to deal with," he said. "Some days you are an OB/GYN assisting with difficulties in delivery. Other days you are a vet trying to figure out what's wrong with a calf to help it." Reed also added nutritionist to the list of his job responsibilities during calving season to make sure that the mothers are getting the nutrients needed to give birth and take care of their calves. "Sometimes you even have to be a rodeo clown dodging a protective mother while helping a calf," Reed said as he scanned the pasture filled with mothers and babies. 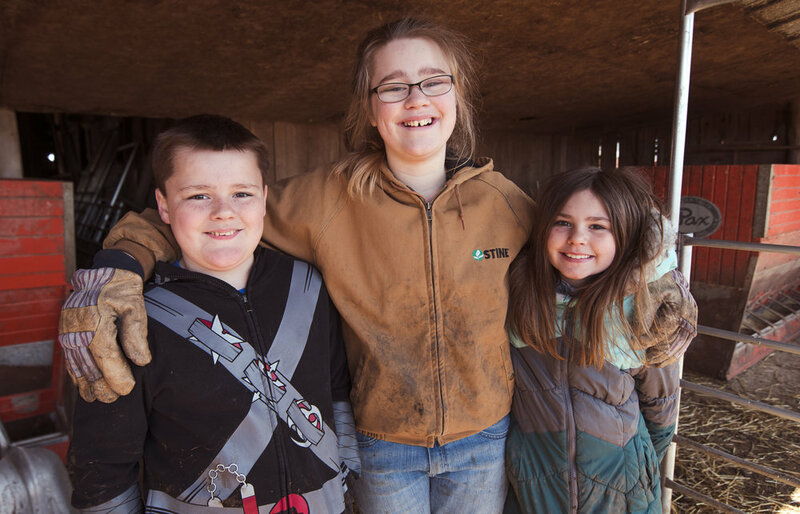 Even though the grind of calving season means work around the clock through challenging weather conditions he wouldn't have it any other way. "It's what I do and I don't know anything different. When you turn the cows and calves out into the pasture for the summer, you can see how good they are doing. It makes all the challenges of getting them started worthwhile," he said. "To know I'm feeding someone else and that person doesn't have to fight these battles gets me through it. 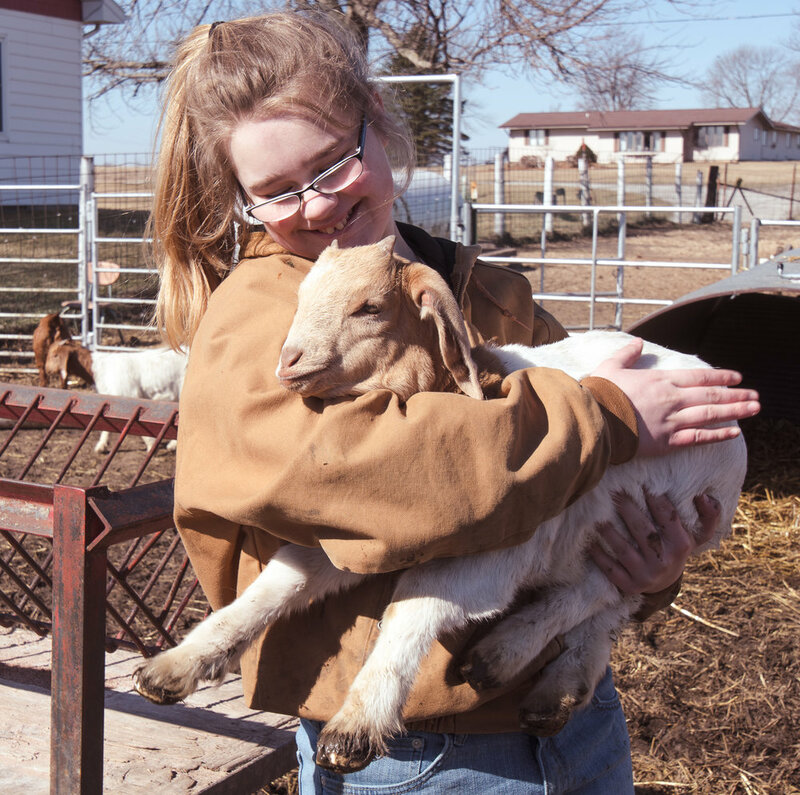 I'll be cold and muddy and worn out if that means someone else can have safe affordable food."